Me, I’d kick pasta and bread to the curb* and live on rice and potatoes! Although my least favorite way of eating potatoes is mashed—people find this CRAZY—but I love them every other way: baked; steamed; scalloped; fried; roesti; boiled; roasted; pancakes; stewed; curried, etc… And of course, home fries! If I was told I could not make this recipe any more, I would get antsy and whiny and my world would shrink measurably. I think I make the best home fries on the planet and people rave about them, like they did yesterday at brunch.They asked for the recipe and I thought it was about time I posted it. 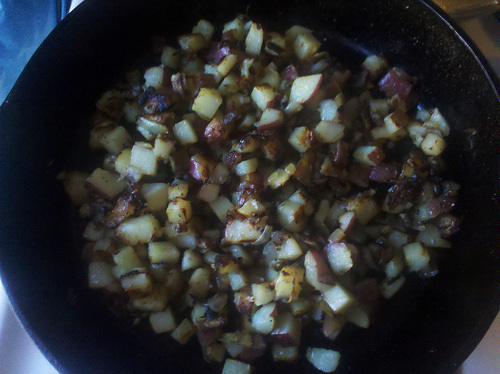 I like my home fries soft as well as crispy with lots of browned onions. I’m lazy, so I don’t believe in pre-cooking the potatoes. I also think they taste better cooked from raw. It’s a very simple recipe, but follow it exactly. The potatoes must be cut the same small size so they cook evenly and quickly. I think that equal parts onions to potatoes tastes best, but you could use less onions and they’d still be good. In a cast iron or heavy bottomed skillet, heat enough oil to coat the bottom of the pan on medium heat. Once the oil is hot, add potatoes and onions. Season with salt and pepper. Cover with a tight fitting lid and cook for five minutes, stir, recover and cook until the potatoes are just tender. Remove lid. Brown the potatoes ( I like the onions to almost burn), stirring periodically. If they seem a little dry, add a touch more oil. Taste and season to taste with more salt and pepper. It will be very tempting to just eat them out of the pan. Be strong. I like them with ketchup and hot sauce or sambal olek. * I do like bread and pasta… remember this is only a hypothetical question.